Live Healthy, Live Happy, Live Long! 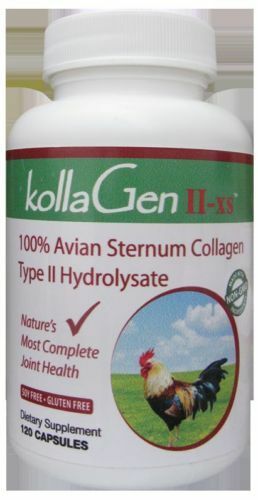 100% Avian Sternum Collagen Type II Hydrolysate 600mg, 120 Capsules THE BENEFITS OF KollaGen II-xsTM CHICKEN COLLAGEN TYPE II Clinically proven effective Improves joint function for an active life style Benefit joint inflammation Increase range of motion and flexibility associted with pain Provides nutrients for joint cartilage health Lubricates and improves flexibility and movement Dietary supplement Patented KollaGen II-xsTM is a Chicken Collagen Type II food supplement that provides all necessary nutrients to promote healthy joint cartilage. Advanced exclusive technology is used to extract KollaGen II-xsTM from young avian sternum cartilage. Collagen Type II is the major component of hyaline joint cartilage. The protein content is between 50% to 70% (less than Type I and III) and naturally occurring mucopolysaccharides (carbohydrates) 30% to 35%. The mucopolysaccharides consists of Glucosamine, Chondroitin, and Hyaluronic Acid, the makeup of synovial fluids. These are combined with the protein amino acids required to make collagen type II cells. KollaGen II-xsTM is laboratory tested. One of every three (3) Americans over the age of 60 suffers from Osteoarthritis. It is a natural wear and tear of our joint cartilage. As we age the body’s ability to make the protein Type II Collagen slows down. This is the protein needed to maintain and rebuild cartilage tissues. HOW DOES KollaGen II-xsTM WORK? KollaGen II-xsTM taken orally as a dietary supplement works naturally within the body as a food source with bioavailability, meaning, it is a ready source of nutrition. It is substantially more effective than just the supplementation of the carbohydrates Glucosamine and Chondroitin. 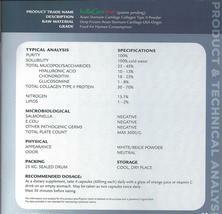 KollaGen II-xsTMnaturally supplies the nutrients necessary to support cartilage. 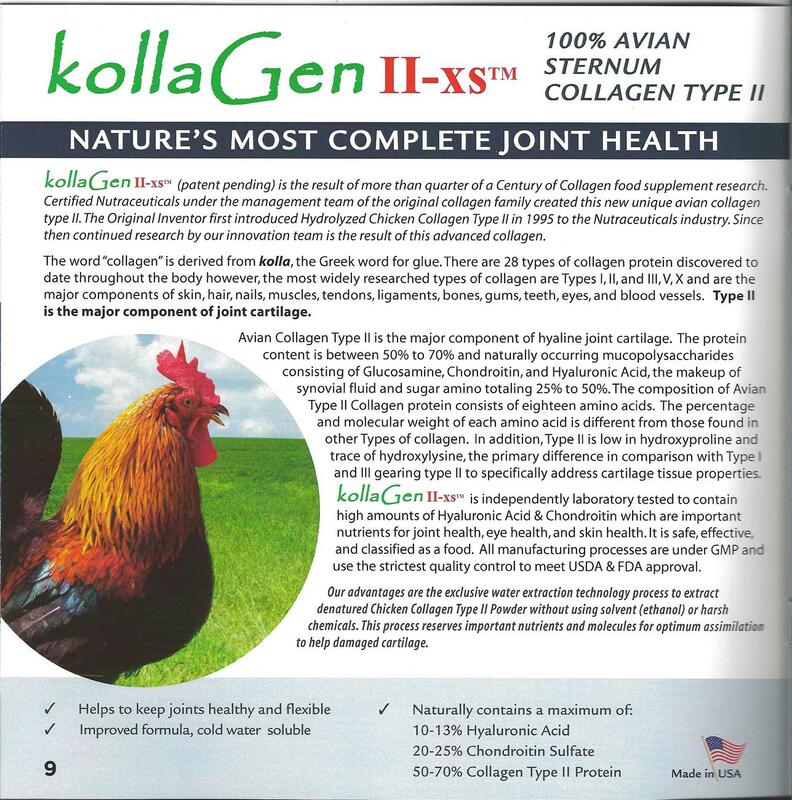 KollaGen II-xsTM Chicken Collagen is processed from avian sternum cartilage using patented low-temperature manufacturing technology to maintain its natural high molecular weight structure and to maintain the integrity of its delicate molecules. The long chain of amino acids is left intact ensuring the body’s own superior natural enzymes recognize the precise genetic code for maximum assimilation for ultimate joint health. It is safe, effective, and classified as a food. All manufacturing processes are under the strictest quality control to meet USDA approval. 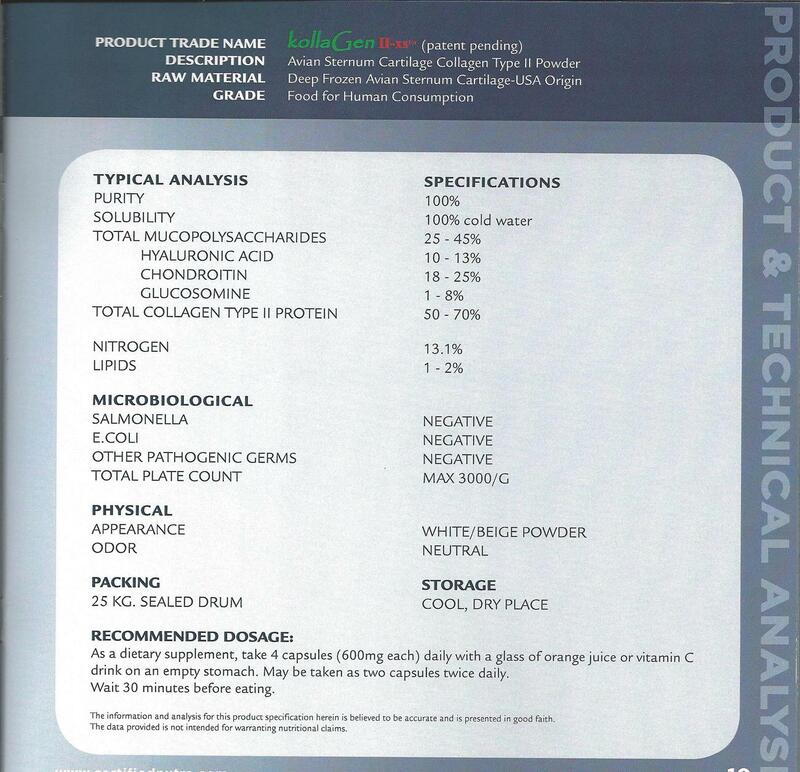 100% Avian Sternum Cartilage Collagen Type II U.S Patent #8,344,106 B1 The Complete Solution Necessary amino acids and mucopolysaccharide found in Avian Collagen Type II is the perfect supplement blend of chondroitin, hyaluronic acid and collagen type II protein. 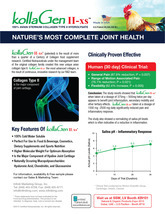 This unique combination of natural nutrients has been scientifically proven effective for joint health. 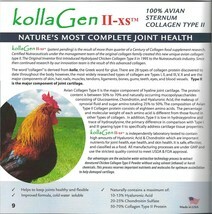 kollaGen II-xsTM Extra Strengthpowder or liquid concentrate is Collagen Type II extracted from young avian sternum cartilage utilizing a proprietary technology water extraction process in manufacturing to maintain the integrity of its delicate molecules without using harsh chemicals or ethanol. 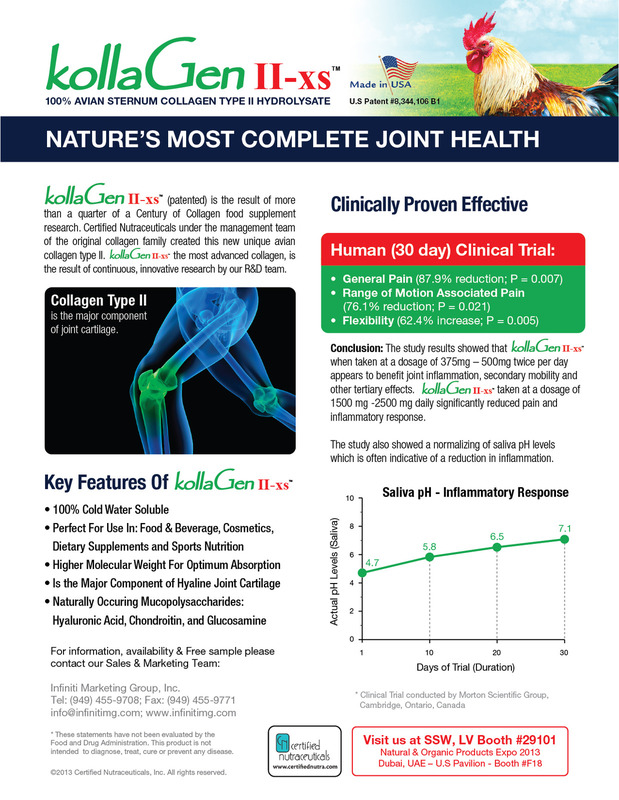 It is certified to contain 55 – 70% Collagen Type II and naturally contains 30 – 45% Mucopolysaccharides (carbohydrates-chondroitin, glucosamine and Hyaluronic acid), the major components of joint cartilage. kollaGen II-xsTM is a safe, oral, total supplement available in powder and liquid concentrate to support cartilage health function and flexibility. It is water soluble and easily mixed with juice, or taken in capsule or tablet form. Why are supplements so important to our health? In an ideal world, we would all eat well all the time. Even if the food we ate were as pure as the water, it still couldn't provide the optimal amount of specific nutrients, so to protect our telomeres (the protective ends of our Chromosomes that support healthy cell replication) we must push our first defense to high alert. The bottom line is that no matter what some nutritionists may say, depending solely on food for your nutritional needs is not enough. If you want to keep your telomeres healthy, you need the right foods and supplements to put up the strongest possible defense against the disease of aging, to which you would otherwise fall victim. Our cutting-edge nutritional supplements will promote cell rejuvenation and enhance health and longevity! *These statements have not been evaluated by the food drug administration. This product is not intended to diagnose, treat, cure or prevent any disease.